First Line: It was the devil's own job, it truly was, thought Hughie Tyndale. While Sergeant Dodd was left behind in London to meet some very interesting people and to solve a mystery in A Murder of Crows, Sir Robert Carey jumped astride a fast horse and made his way to Oxford. Here in An Air of Treason, we've caught up with him. Carey wants to catch up with Queen Elizabeth, who's on progress to the university town; he needs to be paid so he can get back to Carlisle before the season for horse and cattle thieving begins in the West March where he's Deputy Warden. But the Queen has other plans for him. 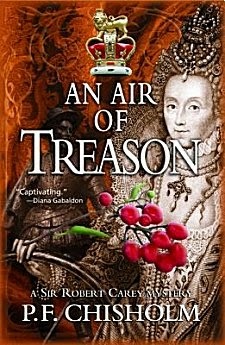 She and Carey's father persuade him to solve a very dangerous cold case-- the mysterious death in 1560 of Amy Dudley, wife of Robert Dudley, the Earl of Leicester, who was the Queen's favorite at the time. Carey wants no part of it, but since he's related to Elizabeth (albeit on the wrong side of the blanket) and she is, in fact, the Queen, he can't refuse. He has barely begun to investigate when he's poisoned and temporarily blinded. He is in dire need of Sergeant Dodd, but Dodd is having his own problems trying to get to Oxford. P.F. Chisholm's series has consistently ranked as one of my favorites in the historical mystery genre, and I'm thrilled to see Sir Robert Carey back in print. She brings Elizabethan England to life in all its intrigues, sights, sounds, and smells-- so much so that once you've stopped reading, it can be difficult to bring yourself back into the correct century. An Air of Treason also has her light touch of humor that I enjoy so much. Poor Sergeant Dodd is a Northerner through and through, and the problems he has in just being understood so far south can be quite funny. As a stranger to the area himself, Dodd is our window into the south of England in the sixteenth century. Sir Robert Carey with his royal connections is our window into the court of Elizabeth I. He's a clothes horse and a ladies man, but he's no fool and very brave. His investigation takes him to Cumnor Place where Amy Dudley died. Since the woman's death, the manor house has been allowed to crumble slowly into the ground, and this is where Chisholm shows us that she can also write scenes that are spooky enough to make the hair stand on the back of your neck. Carey's solution to Amy Dudley's death is a very interesting and satisfying one, and by book's end you'll see that a thread or two has been left dangling, ready to be picked up again in the next book. Although one book runs smoothly into the next in this series, it's not necessary for you to read them all in order for them to make sense... or for you to enjoy An Air of Treason. However, I wouldn't be at all surprised if historical mystery lovers found themselves reading this book and then looking for the rest. I highly recommend them! Cathy - Oh, that's an interesting writing strategy - leaving at least one thread that will connect a novel to the next in a series. And I'm always drawn to a good historical novel. Thanks for the reminder of this series. You're welcome, Margot. I'm hoping that you'll be able to sample it one day soon!